After short post about numerical integration in 1D, I have decided to start with open source project for numerical integration for any function in 1,2 or 3D. If you are interesting in numeric analysis you can find a lot of stuff on the internet. For this blog post I prepared Demo example which extends the previous post by providing integration for 2D function. By using this demo you can integrate any 2D function on area defined by 3, 4 or 8 points. That means you can perform numerical integration for 3 kind of finite elements: triangle, quadrilateral 4-point or 8-point element. 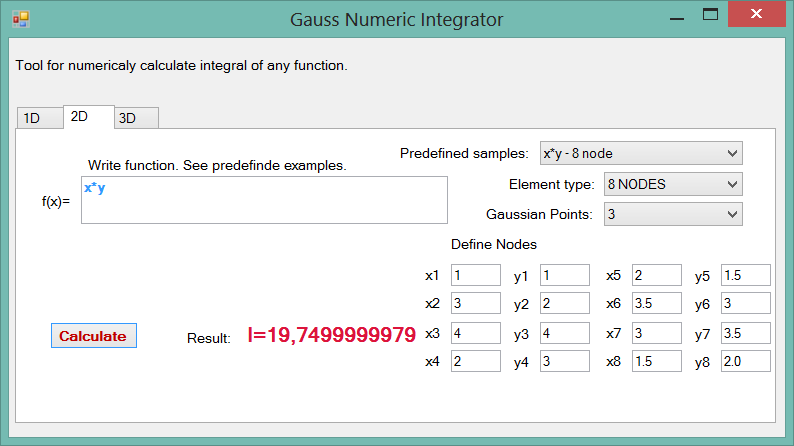 Beside element type you can choose up to 7 Gaussian integration points. The project contains one ClassLibrary and one Windows application (see picture below). Class library contains implementation related to numeric integration: Shape function, partial derivatives of shape function, Jacobina calculation for every element type as well as Integration process. Windows Application implements Form for defining function, and other parameters. The project uses Flee – fast .Net expression evaluator for evaluating string in to math expression. 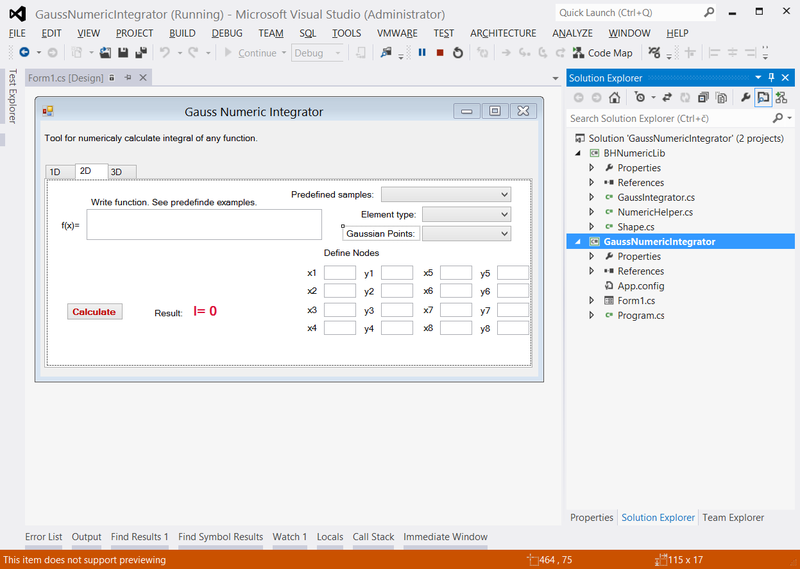 This entry was posted in .NET, C#, Numeric Calculation and tagged .NET, C#, Gauss Integration, Gauss Quadrature, Numeric Integration by Bahrudin Hrnjica. Bookmark the permalink.